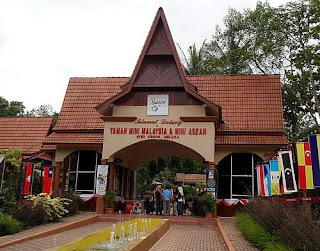 If you are an architecture buff or have a curiosity about the many different cultures and ethnicities which make up Malaysia, then a visit to the Taman Mini Malaysia cultural park near Melaka is definitely recommended. The Taman Mini Malaysia is a theme park of sorts located near the town of Ayer Keroh, a few kilometers outside Melaka. The park showcases the traditional architecture and way of life of the 13 states of Malaysia by way of its interesting exhibits, which consist of various traditional Malaysian homes found in the 13 diverse states of the Malaysia union. Every Malaysian state has its own regional or group style of house with preferred details. While some homes are built on stilts, others are topped with elaborate roofs to block out the heat and others equipped with one or more decorated stairwells. Malaysian homes built on stilts are known as Rumah Panggung, and are largely evident in the many kampungs of Sabah. Similarly traditional homes found in Melaka are known as Rumah Limas and are famed for their elaborate and tiled stairways. The interior of the many showcase dwellings at the Taman Mini Malaysia Park are further adorned with various native arts and crafts to illustrate the culture and heritage of each state. 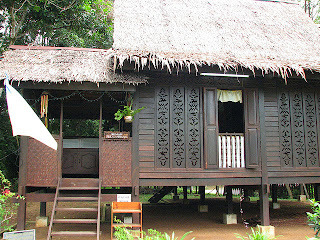 Additionally, the homes are also inhabited by life-like figurines outfitted in traditional wear, so that along with architecture visitors can also peruse various other aspects of life of the many diverse regions of Malaysia. The Taman Mini Malaysia certainly provides an interesting platform for displaying the indigenous lifestyles and abodes of the various peoples of Malaysia. In addition to its attention-grabbing displays, the park also offers various traditional and cultural performances as a part of its endeavor to showcase the native way of life prevalent in the various different regions and states of Malaysia. The Taman Mini Malaysia is a free attraction, which is open to the public daily. Visiting hours are from 9 am to 5pm.